By John C. Toman. Posted November 6, 2011, 8:48 AM. 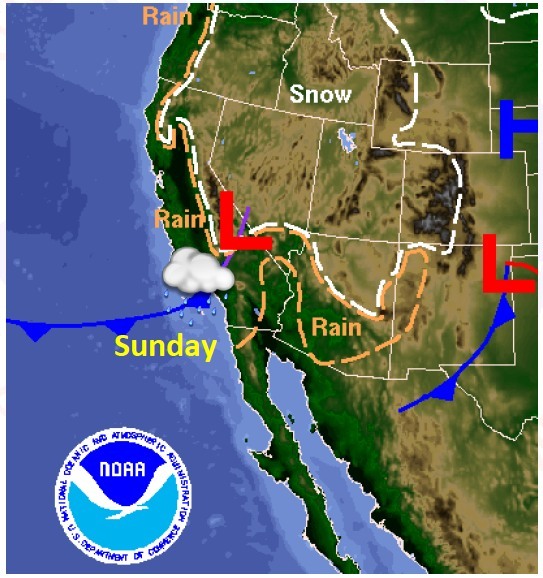 After a brief, cool Saturday respite, a second storm is beginning to arrive in Southern California's inland valleys Sunday. Like Friday's storm, this one is a cold front from the northwest, but it does not have quite as much moisture. Still, rain from this storm will further dampen the fire season. Predictions on Sunday morning are for light to moderate rain to arrive by mid-morning in the northern locations, and late morning in the southern ones. Showers are expected this afternoon, tapering off this evening in the south. Total rainfall is predicted to be less than a half of an inch. Snow levels are predicted to fall to 4,500 feet. On Friday they went as low as 3,500 feet in the high deserts. Gusty winds and breezy conditions are expected to accompany the front. Most of the rest of the week looks dry, but another pair of storms could make Friday and next weekend wet.